We have conducted a sensitive water maser search with the Australia Telescope Compact Array towards 267 1.2-mm dust clumps presented in the literature. We combine our new observations with previous water maser observations to extend our sample to 294 1.2-mm dust clumps, towards which we detect 165 distinct water maser sites towards 128 1.2-mm dust clumps. Within the fields of our observations, we additionally find four water masers with no apparent associated 1.2-mm dust continuum emission. Our overall detection rate of 44 per cent appears to vary as a function of Galactic longitude. We find that there is an excellent correspondence between the locations of the detected water masers with the peak of the target 1.2-mm dust clump sources. As expected from previous similar studies, the water masers are chiefly detected towards the bigger, brighter and more massive 1.2-mm dust clumps. 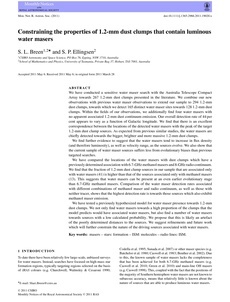 We find further evidence to suggest that the water masers tend to increase in flux density (and therefore luminosity), as well as velocity range, as the sources evolve.We also show that the current sample of water maser sources suffers less from evolutionary biases than previous targeted searches. We have compared the locations of the water masers with dust clumps which have a previously determined associationwith 6.7-GHz methanol masers and 8-GHz radio continuum. We find that the fraction of 1.2-mm dust clump sources in our sample that are associated only with water masers (41) is higher than that of the sources associated only with methanol masers (13). This suggests that water masers can be present at an even earlier evolutionary stage than 6.7-GHz methanol masers. Comparison of the water maser detection rates associated with different combinations of methanol maser and radio continuum, as well as those with neither tracer, shows that the highest detection rate is towards those sources which also exhibit methanol maser emission. We have tested a previously hypothesized model for water maser presence towards 1.2-mm dust clumps. We not only find water masers towards a high proportion of the clumps that the model predicts would have associated water masers, but also find a number of water masers towards sources with a low calculated probability. We propose that this is likely an artefact of the poorly determined distances to the sources. We suggest refinements and future work which will further constrain the nature of the driving sources associated with water masers. masers – stars: formation – ISM: molecules – radio lines: ISM.